Quinn backs Boys in Green to have a big impact at Euro 2016. 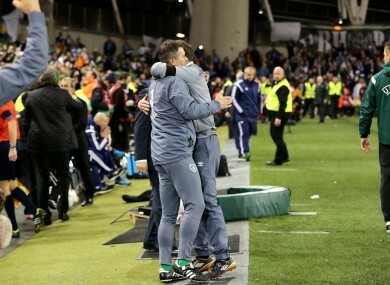 Roy Keane, left, and Martin O'Neill embrace as Ireland confirm their qualification for Euro 2016 with victory against Bosnia-Herzegovina last month. THE HARD WORK of Martin O’Neill and Roy Keane has paid off and that leaves Ireland in much better shape heading into the European Championships this time around, according to Niall Quinn. After a disastrous 2012 campaign under Giovanni Trapattoni, which saw comprehensive group-stage defeats to Croatia, Spain and Italy, the former Ireland international has no fears of a repeat performance in France next summer. “Having spoken to a number of players off the record about the whole tournament (Euro 2012), from the moment they got there, until they moment they got home, it was a bad experience all around. “They didn’t feel like a team who were going to go out there and win games. It was a very difficult group, don’t get me wrong, but I just feel that there is something different about this side, there’s a competition for places. “They’ve made extraordinary progress. Because I heard everybody years ago saying ‘we haven’t got the players’. And then Martin (O’Neill) came in and it was really difficult. “And he has gone in and brought that prevailing attitude to a place where people believe they can go on and achieve things that were out of sight a couple of years ago under Trapattoni. “That motivation, that self-belief that Martin has instilled into this team, that’s the most recognisable trait of Martin and Roy, that they have this group believing in themselves. You just have to look at Jonathan Walters and see how he performs in an Ireland shirt. Quinn, who scored 21 goals for Ireland in 88 caps, believes the competition for places in O’Neill’s side is something that had been lacking in recent years. And that should leave Ireland in good stead as they build towards the Euros. “The players coming in like (Richard) Keogh and Darren (Randolph) are not overawed by the occasion. They are motivated to be better than the players they replaced. “So the ones they’ve replaced then have a job to get back in the team. The former Arsenal, Manchester City and Sunderland striker believes Ireland have become a side to fear in European football, something which we may not realise. “I spoke to a Bosnian journalist after the play-off. And he said when Ireland came out of the hat that was their worst option. They were devastated when Ireland came out and that’s a huge compliment to Ireland, something we probably didn’t fully understand before the game. “We threw the shackles away and through some hard work, perseverance and great finishing from Jonny Walters, we got there in style. “I think whoever we get (in the draw) will worry more about us than we will about them. And will Quinn go to these finals as a fan, having been to three major international tournaments as a player? Email “'There is something different about this Irish team'”. Feedback on “'There is something different about this Irish team'”.